Sclerotherapy, a simple technique performed in Dr. Jacobs' office, is a fairly safe and relatively effective treatment for nearly all unwanted varicose veins with diameters of less than one millimeter. Though a fine needle is used, the procedure is tolerable and is not unbearably painful. The names for the vessels treated by sclerotherapy include sunburst vessels, telangiectatic vessels, unwanted leg veins, and spider veins. Varicose veins are caused by leaky valves in the venous system. Over time, gravity causes the blood to flow with high pressure through the leaky valves to the surface of the skin, thus expanding the vein. If you have an inherited predisposition to develop leaky valves, you will probably continue to develop new varicose veins, since the venous system has thousands of valves that may potentially leak. Dr. Jacobs injects an irritating solution into the vein to close it. 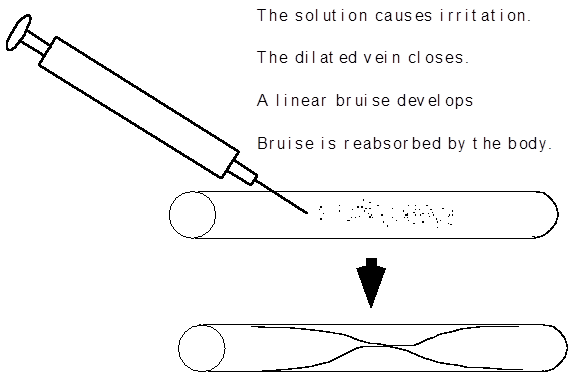 Please review the following diagram showing injection of the vein, followed by irritation and closure. The vein disappears as the vein and linear bruise are absorbed by the body through the body's natural healing mechanisms. The key to the safety of sclerotherapy is its tissue selectivity. In successful cases, sclerotherapy causes a delicate injury inside the vein without harming the surrounding tissue. In addition to offering potential improved cosmetic results without scarring, sclerotherapy may also help eliminate the burning, aching, and discomfort often caused by the small varicose veins. Now, with the availability of sclerotherapy, certain patients may not need to undergo extensive stripping of small varicose veins. Stripping may result in multiple scars and a significant recurrence rate. Sclerotherapy is a simpler method to try first. Please note: the pain is usually not too excessive. Most people have no problem with pain. Overwhelming evidence suggests that early treatment is the best. Superficial varicose veins usually enlarge and spread over time, causing ankle swelling, stasis dermatitis, and leg ulcers. Leg ulcers and stasis dermatitis may become chronic and difficult to manage. These conditions may be preventable through early treatment. What type and size of veins can be treated? Dr. Jacobs can use sclerotherapy to treat spider veins less than or equal to one millimeter in diameter. Larger veins may require deeper, more aggressive sclerotherapy, stripping, or surgical intervention. Because of the need for possible hospitalization, general anesthesia, and careful monitoring, the larger veins should be treated by a vascular surgeon. Smaller varicose veins are much more common than the larger varicose veins. Because of Dr. Jacobs one millimeter diameter guideline, the incidence of adverse side effects is significantly decreased for Dr. Jacobs sclerotherapy of smaller veins compared to the side effects for sclerotherapy or stripping of larger veins. The only veins that Dr. Jacobs does not treat are those larger veins directly related to leaks from the greater saphenous vein. The greater saphenous is a larger vein that empties into the groin area and is connected to the femoral vein, which flows directly back to the heart. The majority of the small spider veins can be easily treated by small vessel sclerotherapy in Dr. Jacobs' office. Please understand that the leg vein sclerosing procedure is usually done on a different day than the leg vein consult for first time patients. Dr. Jacobs first interviews the patient to determine if the patient is a candidate for the procedure. On a second visit, Dr. Jacobs administers the solution. For preparation, please do not take Advil, Motrin, Aspirin or similar blood thinning drugs for four weeks prior to the appointment. Prior to the procedure, you should avoid shaving your legs 24 hours before the procedure. On the day of the procedure, you may prepare by bringing with you to your appointment, four, 4 Inch wide Ace elastic bandages, two for each leg. You may purchase these at your local pharmacy. You may also benefit from a pair of supportive elastic stockings. Be sure to shower yourself on the morning of the sclerotherapy. You should carefully wash your legs with an antibacterial soap such as Dial. Do not use any moisturizers, make-up, or other substances on your legs after your shower. You will not want to wear stockings to the appointment. 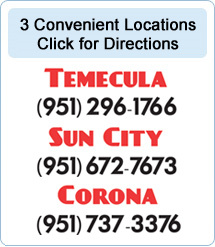 You will probably be more comfortable in a loose fitting skirt or loose fitting shorts. Pants should not be worn for the appointment. Wear comfortable shoes, not high heels. Please read the consent prior to your visit as you may have unanswered questions. After explaining sclerotherapy to you, and after a brief interview, Dr. Jacobs ascertains whether or not your varicose veins could benefit from small vessel sclerotherapy. Next, Dr. Jacobs injects a small amount of polidocanol solution into the veins. The treatment takes from 10 to 30 minutes. To allow the solution to irritate the vessel walls, pressure is applied by placing Ace wraps over the treated areas. 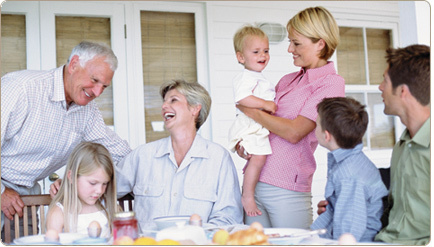 Patients are encouraged to rest and reduce normal daily activities immediately following the treatment. For optimum benefits, the legs should be elevated as much as possible for 48 hours. The Ace wraps can be removed after 48 hours. Patients with larger varicose leg veins may have to wear prescription support hose for 1 to 3 weeks. While not all veins disappear entirely with a single treatment, many are and many more can be eliminated with a second treatment. Occasionally, three to four treatments per area may be required. The second treatment is usually much easier than the first. Once treated, do veins recur? The recurrence rate for sclerotherapy is somewhat lower than that for vein stripping and other surgical procedures. On the average, 10% of sclerotherapy treated veins will recur, but most varicose veins that appear on the leg after treatment are new varicosities. If you have an inherited predisposition to develop leaky valves, you will probably continue to develop new varicose veins, since your venous system has thousands of valves that may leak. Thus, once your legs have been cleared of varicose veins through sclerotherapy, you may have to return for treatment of new veins every few years. For prevention, Dr. Jacobs suggests exercise, elevation, and elastic stockings. Because of Dr. Jacobs' one millimeter diameter guideline, the incidence of adverse side effects is significantly decreased for Dr. Jacobs sclerotherapy of smaller veins compared to the side effects for sclerotherapy of larger veins. There is always the risk of life-threatening allergic reaction to polidocanol, but one has this type of risk with any internal medication. Occasionally, some of the irritating solutions may leak out of the vein and may injure the skin causing a small ulceration (less than 1%) at the site of the needle insertion. Another potential risk is that a small amount of blood may be trapped in the closed off vein and may be turned into iron pigment, leaving a brown streak where the vein used to be. The brown streak may disappear over 6 to 12 months, however, as the body naturally absorbs the iron pigment. The development of a skin blush, called matting, around the treated area is another possible side effect. Matting usually fades and disappears within several months. The risk of thrombophlebitis or the development of a blood clot is extremely rare at less than one tenth of one percent or 0.001%. Pregnant women should wait at least 6 months after delivery before seeking treatment because many varicose veins will spontaneously disappear after the baby is born. Sclerotherapy is not recommended for people who are pregnant, or who have known vascular problems or a history of deep thrombophlebitis or bleeding disorders such as hemophilia. Dr. Jacobs will not treat people who both smoke and are on oral contraceptives because of the increased risk of blood clots, and people on blood thinning drugs, people with diabetes, artificial body parts, a history of bleeding, or any chronic disease that may be complicated by the procedure (Lupus, Vasculitis, thyroid disease, etc.). Additional side effects are listed on the accompanying consent. PLEASE DO NOT SIGN THE CONSENT WITHOUT FULLY READING IT IN ITS ENTIRETY. Small superficial veins in the legs can be treated with saline (salt water solution) as well as with other materials which are injected directly into the vein. Dr. Jacobs uses a solution called polidocanol. Polidocanol is a sclerosing solution from Switzerland, and has been safely used in thousands of patients. Because Polidocanol has not completed testing by the United States Food and Drug Administration, Polidocanol is not approved for use in the United States. Interestingly, the statistics show that Polidocanol has a safer side effect profile than any of the sclerosing solutions currently approved by the FDA (Sodium Tetradecyl Sulfate and Sodium Morrhuate). For this reason, Dr. Jacobs and many other dermatologists choose to use Polidocanol rather than any other sclerosing agent for leg vein patients. Polidocanol solution acts by irritating the lining of the unwanted vein, thus causing inflammation and closure of the vein. This process is known as "sclerosing". The treatment is not exact. As with any medical procedure, 100% assurance or guarantees cannot be made, and as with any medical procedure, certain side effects may occur. The procedure involves using a thin needle to inject the sclerosing solution directly into the vein. Most of the time, the tiny vein is sclerosed as described above. Once in a while, the sclerosing solution may leak into the surrounding tissue, or the vein may burst, causing leakage of the sclerosing solution into the surrounding tissue. If leakage occurs, a bruise may form. The bruise may become dark and may take up to one year to fade. In certain cases, the bruise may develop into an ulcer that may take time to heal. The site may eventually heal with a scar. The site may develop an infection requiring oral antibiotics. Another possible side effect could be the development of many tiny blood vessels in the area of treatment. These vessels may remain, permanently, or may resolve with further treatment. The most serious possible complications include possible blood clots to the heart, or a possible (suffocating) allergic reaction to the sclerosing solution. The degree of improvement is usually viewed as judged by the decreased purple color of the veins treated. The cleared veins do not usually reform, but may recur. Several treatments may be required depending on the severity of involved veins. Because unwanted leg veins may be an ongoing problem, new veins may develop. Support hose and improved leg muscle tone may decrease the rate of new varicose vein formation.